Sunday was almost a GREAT day for Splash Hits. Nah, come to think of it, it was a great day for Splash Hits. Brandon Crawford led off the bottom of the 10th inning by hitting his first Splash Hit, shooting a pitch off Rex Brothers (a left-hander no less) into McCovey Cove right down the right-field line to lift the Giants over the Rockies 5-4. It was the first Splash Hit since Pablo Sandoval put one in the water on May 12, 2013. Sandoval almost made it two Splash Hits in the same game in the sixth inning. Sandoval’s shot to over the No. 3 archway was well on its way to the Bay, but the ball actually hit one of the flag poles that rise high above the Willie Mays Wall in right and bounced back. If Sandoval had reached the water, it would have been a first — it would have been the first time two different Giants hit Splash Hits in the same game. Barry Bonds twice hit a pair of Splash Hits in the same game — on May 10, 2000 vs. the Cardinals (Nos. 2 and 3 Splash Hits overall); and May 18, 2002 vs. the Marlins (Nos. 19 and 20). Crawford’s home run was the 64th Splash Hit at AT&T/SBC/Pacific Bell Park. He became the 17th different player to record at Splash Hit. (Remember: Splash Hits are home runs on the fly into the bay hit by Giants hitters). It was also the second walk-off Splash Hit. Barry Bonds had the other on Aug. 19, 2003. So Barry Bonds hit 35 career Splash Hits. 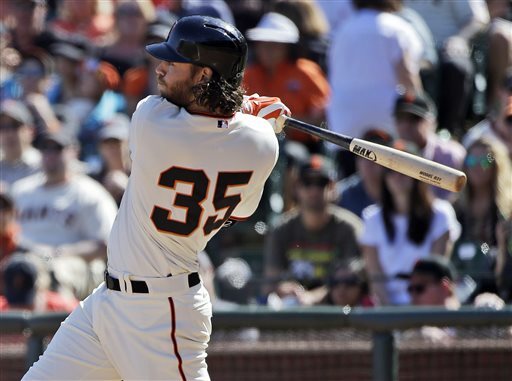 Barry Bonds spent time this spring working with Brandon Crawford. Brandon Crawford hits his first Splash Hit. After an off day, Tim Lincecum faces Josh Beckett as the Giants and Dodgers open a three-game series at AT&T Park at 7:05 p.m. Tuesday. The San Francisco Giants took another injury hit on Tuesday when they placed third baseman Pablo Sandoval on the disabled list. There was a little bit of confusion over the nature of the injury. 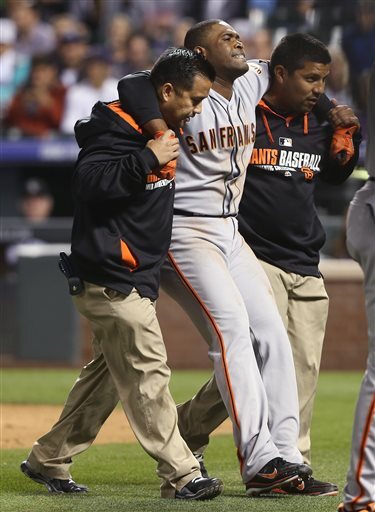 Giants CEO Larry Baer said on Monday it was a hairline fracture in his foot. The Giants corrected that on Tuesday, saying that the MRI revealed a previous hairline fractured that had healed. The team says the nature of the injury is a strained tendon in his foot. 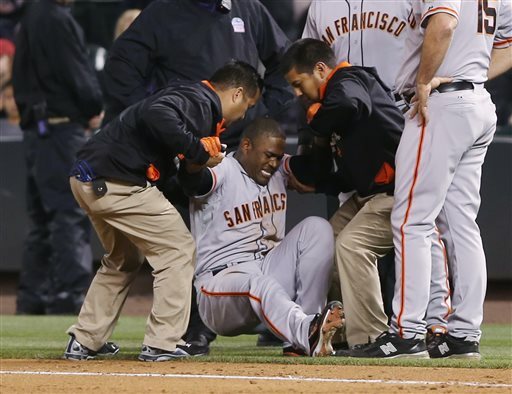 Sandoval hurt his foot back in late May and aggravated it on Friday. The Giants feel that two weeks off is the only way for Sandoval to heal and expect him back with the team on June 24 when his 15 days are up. Because of the shortest possible DL stint, the Giants are going to fill Sandoval’s vacancy with a combination of Joaquin Arias taking over the starting role at third base and Tony Abreu and Nick Noonan as backups. Noonan was recalled from Triple-A Fresno after only playing one game for the Grizzlies after his recent demotion. “With (Arias) and Noonan and Abreu, we can ham-and-egg this until we get Pablo back,” manager Bruce Bochy said. 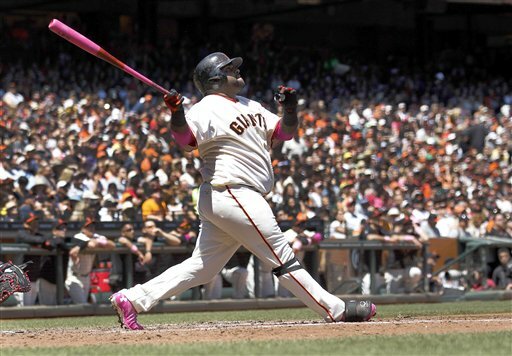 OK, OK, we like to have fun with the Sandoval’s weight, but the Giants say there is no way of telling if the Panda’s girth had anything to do with the injury. But the Giants did want Sandoval to work on his conditioning during his DL stint. Why? Well, obviously Sandoval’s fitness has been a problem since spring training. 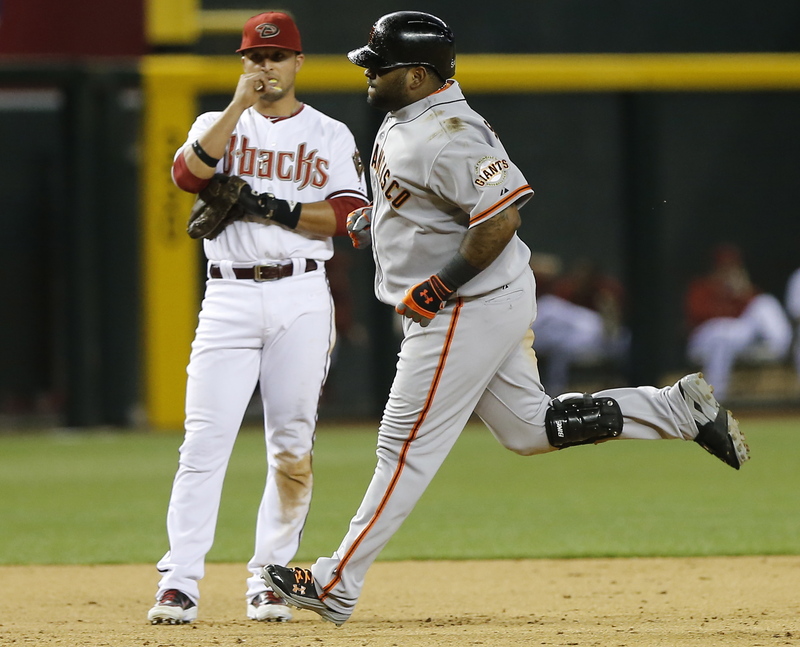 Unlike previous offseasons, Sandoval didn’t spend time last winter trying to shed pounds. Plus, he’s put on weight during his previous stints on the DL. He added pounds when he broke his hamate bone in one hand in 2011, when broke his OTHER hamate bone in 2012, when he pulled his hamstring in 2012. In the meantime, the Giants will turn to Arias. Arias did a nice job filling in for Sandoval last season, which earned him a spot on the team all the way through the postseason. He has not done much this season, hitting .220. But he also has been limited to 10 starts. He got off to a very cold start, but is hitting .276 over the past four weeks. There has been some chatter about the Giants bringing up another third baseman to replace Sandoval’s bat, but there really aren’t any plausible options. I saw someone mention Adam Duvall, who is playing third base at Double-A Richmond. But he’s only played 27 games above Class A, and those all came this year as Duvall missed time this season with an injury. It was a busy weekend for MoreSplashHits. Hey, it was Mother’s Day weekend, so we weren’t blogging much. But we were stilling watching the Giants, and Sunday’s game provided us with another Splash Hits. It was Sandoval’s first Splash Hit since Aug. 31, 2011 and the seventh of his career. That ranks him second all-time behind …. some guy named …. Bonds, whoever that is. Brandon Belt had delivered the last three Splash Hits. Belt also homered Sunday, but he hit his the other way to left field. Here’s a list of Splash Hit leaders. Sunday’s home runs helped cap a relaxing weekend for Giants fans. 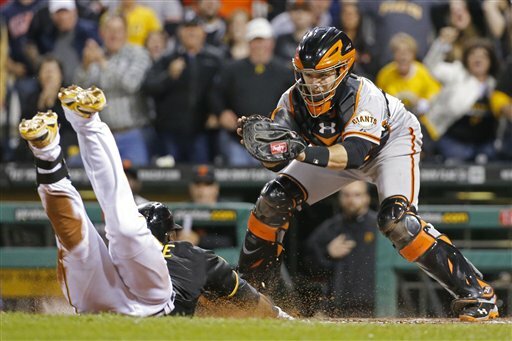 Prior to Friday, the Giants had only won two games without the need of a save or walk-off win. None of the three wins against the Braves over the weekend required a save or walk-off win, with the Giants winning 8-2, 10-1 and 5-1. Before Friday, the Giants’ run differential was 0. Now, it’s +19. 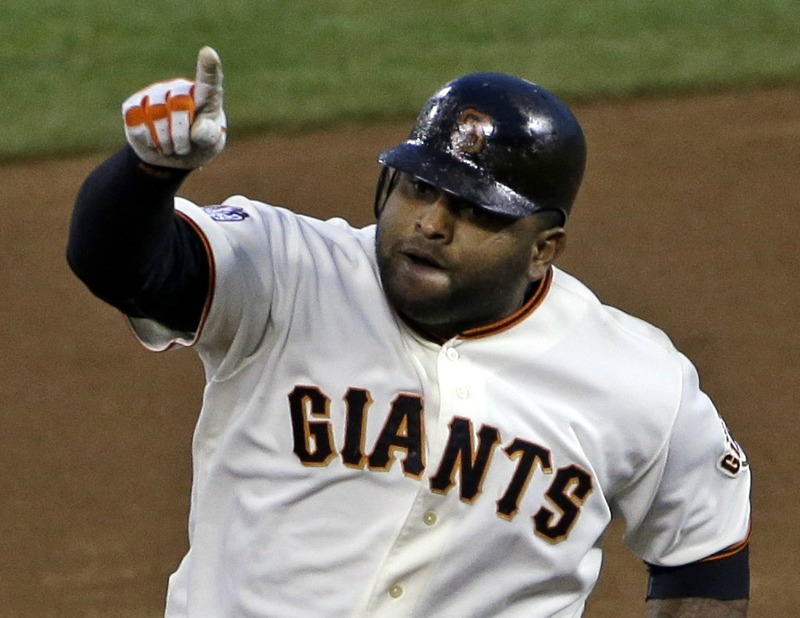 Have you ever wondered what’s up with all that gunk on Pablo Sandoval’s helmet? I’ve been watching baseball games for more than 30 years. But I ran across something I never realized before. So I thought I’d share with you. I shrugged the suggestion off. I mean, Pablo’s not the first nor the only player to encase his batting helmet in gunk. 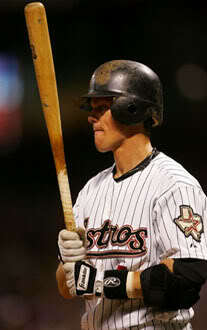 I can remember Craig Biggio doing it in the 1990s and early 2000s. 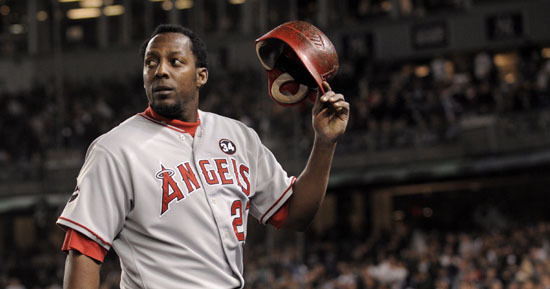 And Vladimir Guerrero was another culprit. And, of course, Manny Ramirez. It just seemed like an age-old tradition. But last week while watching game, one of the TV commentators talked about the gunk on the helmets, and gave a perfectly logical explanation that never dawned on me before. It’s pine tar, that sticky substance that is normally on a rag on the on-deck circle for batters to apply to the handle of their bat for a better grip. 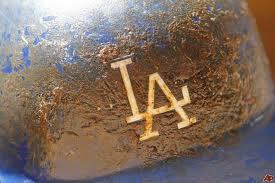 Well, some hitters will also rub that pine tar rag on their helmets as they head to the plate. Why? Well, if you’re in the middle of a particularly long at-bat and you want a little more stick to your grip, you don’t have to walk back to the on deck circle to grab the pine tar rag — and the umps probably wouldn’t let you — you just have to adjust your helmet and get a little more pine tar. But some players have taken this practice to the new level. Take a look at this image of the Dodgers’ Matt Kemp. I was watching Kemp last week, and I saw that stain on his shoulder. 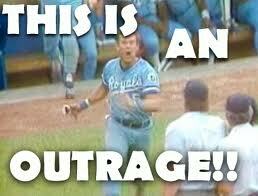 I couldn’t remember Kemp making a diving play in the outfielder or sliding on the basepaths to get that stain. And even if he had, how could the only stain be on his shoulder. 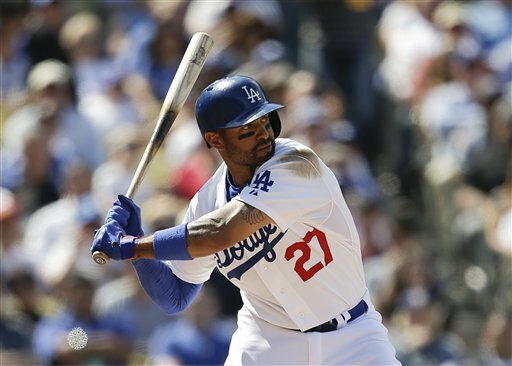 Then I realized that Kemp, instead of rubbing his batting helmet in pine tar, he rubs the rag on his shoulder for his extra supply when he is at the plate. Of course, there is an inherent danger to carrying all this pine tar on your body. What if you helmet flies off your head as you’re racing down to first base. The pitcher could pick the helmet up for the hitter and hand it back to him. Looks like a nice gesture until you realize that the pitcher has some sticky pine tar on his pitching hand and is now able to snap off some wicked sliders or curveballs. And, of course, whenever you play around with pine tar, it’s always a good idea to be careful. You don’t want to end up like this guy.